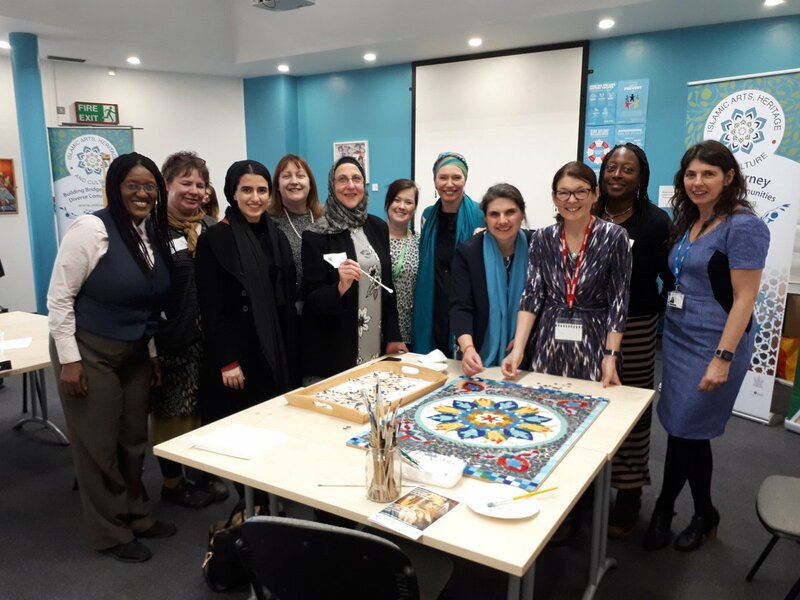 Milton Keynes Islamic Arts, Heritage and Culture (MKIAC) held an event to celebrate “International Women’s Day” and the role women have made in creating culture whether that be in the home or in the workplace. Over 60 delegates from our rich and diverse communities of Milton Keynes came together at Milton Keynes College Chaffron Campus to celebrate. 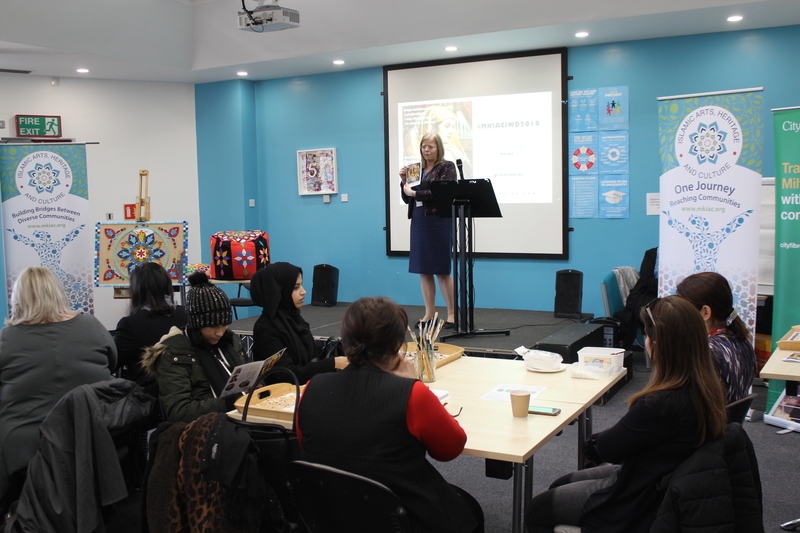 Dr Julie Mills, CEO & Principal of MK College opened the event and made very poignant remarks that although we have made progress towards equality we still have further work to do on diversity, especially around promoting more opportunities for women in leadership. Jane Anderson a solicitor and MKIAC board member gave us examples of how women only recently have caught up with men in equality, she told us how women lawyers were only allowed to wear trousers in court in 1994 and women in the UK were only able to have a bank account without a male guarantor from 1975. Susan Popoola a human value optimisation specialist talked about the valuation of people, their journeys of where they are now and how they progress, she gave the metaphor of people being pigeons and peacocks and that we can all be both at different times and that peacocks are important in innovation whilst pigeons create a stable workplace. Dr Jane Krishnadas drew on her experience working India providing earthquake relief and how women adapted and engaged in agriculture, start-up business as well as being homemakers. She talked about her recent work providing support in the legal system through Community legal outreach Collaboration with Keele University where she is a senior law lecturer and emphasised that human rights were culturally different with different sectors of the population and were equal only in their practicality in daily lives. 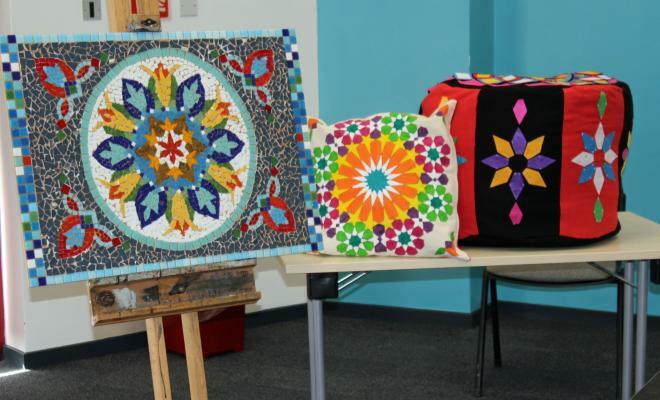 Humera Khan a founder and trustee of the An-Nisa Society an organisation working for the welfare and support of Muslim women and families gave a history of how Muslim women have contributed to culture and are creating new cultural spheres today. Humera highlighted the importance of supporting Muslim women and breaking down barriers often by the media. She showcased examples of strong Muslim women including those performing in Rumi’s Cave a creative space run by Muslim women for Muslim women. Mimi Harker MBE councillor, former cabinet member and mayor not only gave a political account of her career as a women but an insight to her personal journey from being a less confident timid person to a strong role model for women and that through her determination and passion for standing up for communities she has been recognised nationally by being an Olympic torch bearer and being awarded an OBE. Lunch was provided for the guests with flavours from Arabia such as Lebanese style courgettes stuffed with fresh herbs, aromatic spices and mixed vegetables to Kibbeh: bulger wheat stuffed with Lamb. The event was inspired by strong Islamic woman such as Kadijah an independent and respected Muslim business women and an equal partner to her husband, and Fatima al-Fihri who established the first degree granting university founded in Morocco in 859. 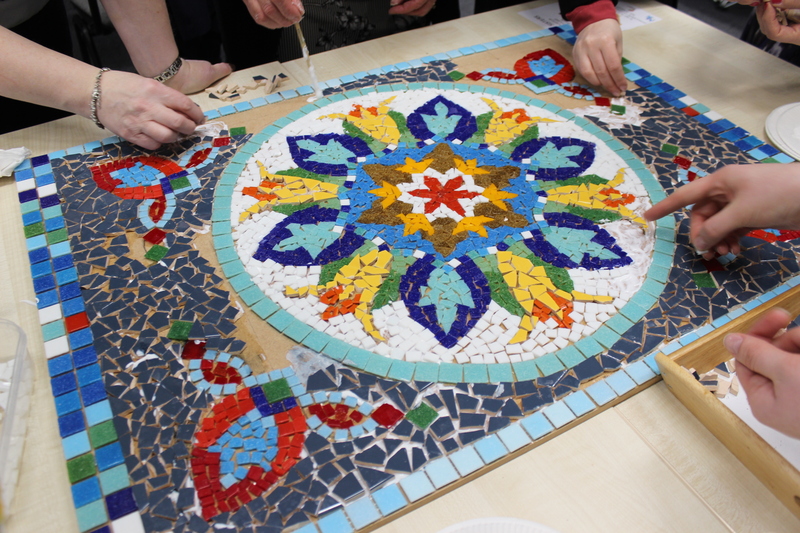 There then was an opportunity for delegates to learn or showcase their mosaic skills through an artist led session to produce a large mosaic using an arabesque design combining geometric and botanical imagery. 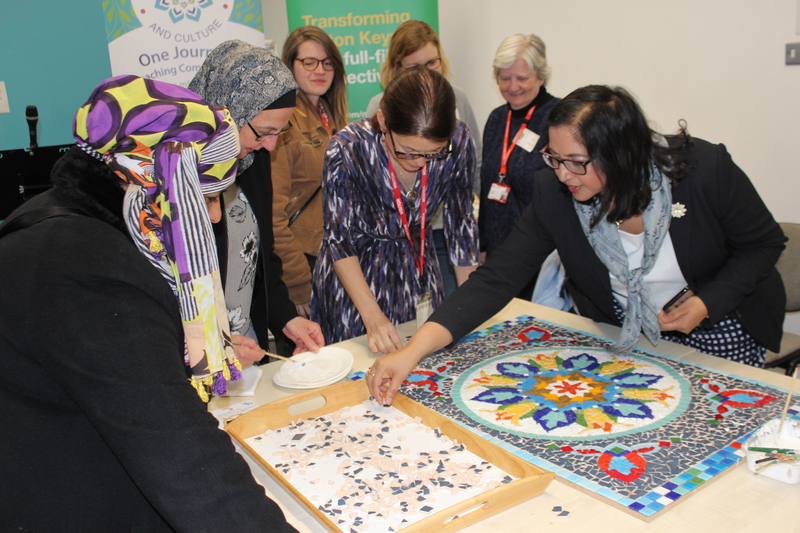 Mosaic making has been part of Islamic culture for centuries; we invited women to take part in this activity as a token of our unity and celebration of our diverse cultures and at this seminar. This workshop was led by Maryam Smit MKIAC’s resident artist.